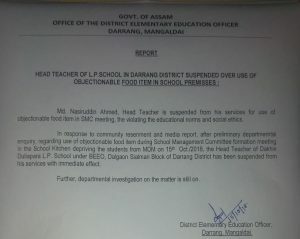 The District Elementary Education Department of Darrang district in Assam has suspended a head teacher of an LP school from his services for use of objectionable food item in the school management committee meeting, thus violating the educational norms and social ethics. In response to community resentment and media reports, a preliminary departmental inquiry was conducted and it was found that objectionable food item was used during the school management committee formation meeting in the school kitchen depriving the students from their legitimate mid day meal on October 15 last. The matter came to light on Monday. 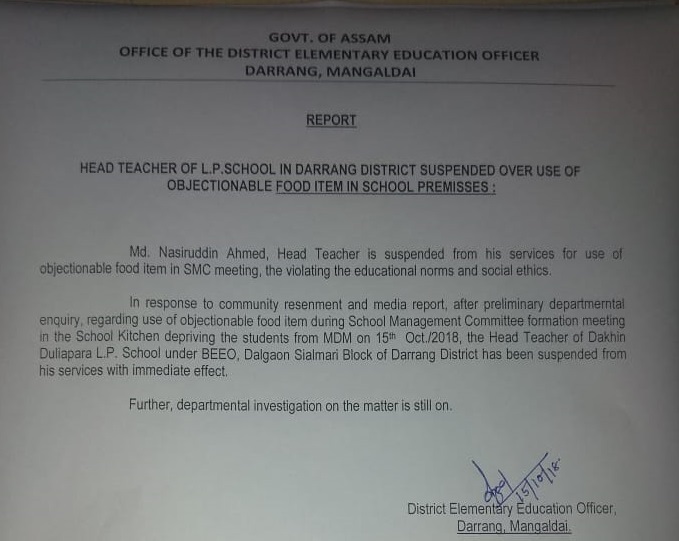 On the account of the offence, the head teacher, MD Nasiruddin Ahmed, of Dakkhin Duliapara L P School under Block Elementary Education Office of Dalgaon Sialmari Block of Darrang district has been suspended from his services with immediate effect. Meanwhile, further departmental investigation into the whole matter is still on.